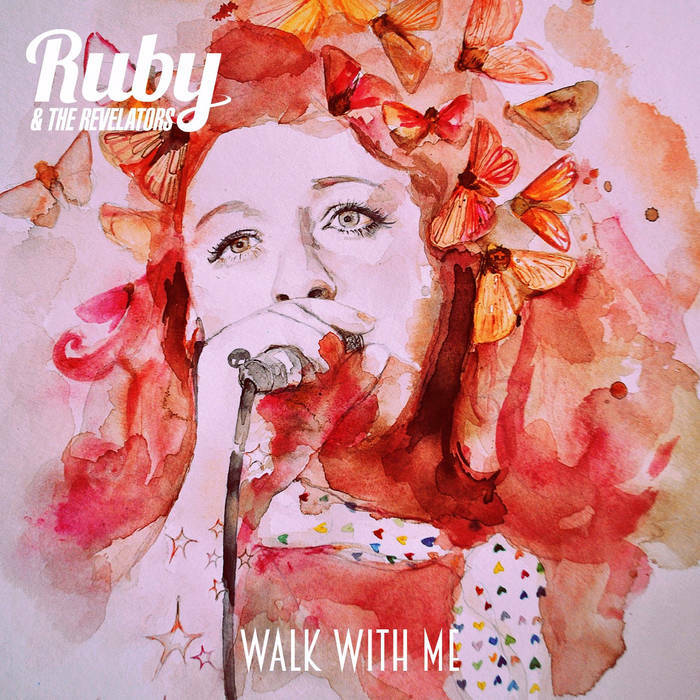 Walk With Me New Album from Ruby & The Revelators is a stroll of musical pleasure, ten tracks that explore a wide breadth of musical landscapes. The album’s continuity and shape are maintained by the quality and consistency of the vocals of Olivia Stevens aka Ruby Tiger. Vistas, her previous EP, is very different from this accomplished, confident debut album. The songs all have a swing you can hear her smile on every track, the music has a relaxed and live feel, many of the numbers are a key part of her live set. Ruby is comfortable not being restrained by a genre she allows her vocals to do the talking. Opening with When I See You, the opening refrain shapes this uplifting number that has a mainstream and accessible tone. The pace slows with piano setting the soulful landscape we are passing through on Soul Recovery Service. As we are infused with soul, blues, jazz and pop the scene is set by classy musicianship from the band that Ruby has surround herself. They make her luscious vocals sound richer full of powerful warmth as she explores the lyrics. Her empathy is popping out of the speakers as we hear about Coal Into Gold with Louise’s guitar adding spice and a zing. Three tracks in and you are hooked by the tonal textures, as you sit back and let the number flow out of the speakers. You are waiting for the next track whilst not waiting for the current song to end. Ruby’s vocals have always been clarion clear now it has evolved into a controlled medium to deliver the music she wants us to hear. It has style and class that lingers the kings are adding another layer and no one will pity Ruby with her voice! The blues of Pity City is captivating grabbing your attention that you do not want to let go, and then there is Cold Cold Winter, which following this cold spell we can relate to. The use of a jazz tempo and style is the perfect shaping of the lyrics. It shapes the tone of a person alone and isolated in a Cold Cold Winter. Having journeyed with Ruby, she closes out the album with some fun in Find Me a Man that picks up the tempo and let’s kick up your heels and dance to a song that takes you back in tone and delivery to the Speakeasy’s of the 1920’s. Closing the album out with a Rollo Markey number and the title track, Walk With Me. The tempo curves again this has been a musically interesting Walk with Ruby and her band. Now slower, considered and shapely. This is the song that gives the album context and brings the album to a satisfying close. What Ruby says about an album she is rightly proud of “…united by my love of language and traditional songwriting. Myself and co-writer Louise Maggs wanted to create what we hope are unique melodies and ambient soundscapes. Lyrically, they draw on my life; the good, the bad, the ugly, the poetic and the transformative.” Having sat back and listened this is an album about life the glittering and the grime, personal highs and lows we can relate to the songs with Ruby on Walk With Me, we have walked those streets as well. Life’s experiences once again the fuel for a sassy album.